Sifts and Cleans Your Litter in Just Seconds! Finally, the perfect cat litter box for you and your cat. Designed and developed by a cat lover. Litter Spinner is a new, unique and revolutionary cat litter box that solves pet owner's most annoying cat box problems while providing your treasured pet with a clean, safe, comfortable, and private place. The Litter Spinner is easy to use: simply fill the bottom of your litter spinner with 2 1/2" - 3" of your favorite clumping cat litter. When you want to clean your new Litter Spinner just spin one turn, your dirty cat litter is now clean. Cat waste is collected into an easy to empty drawer. 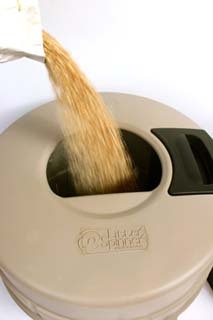 No more scooping, no more costly replacement containers, no more handling of messy cat litter. It really is that easy. Since it only takes seconds you can clean your cat's litter box as often as you desire by simply rotating it. Your beloved cat will have a fresh, clean, ready to use litter box. 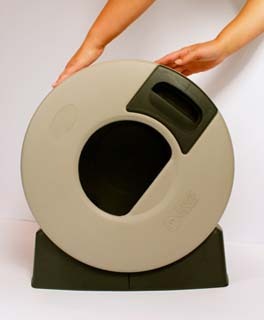 The Litter Spinner is so simple that you will be amazed how easy cleaning your cat's litter box has become. The Litter Spinner is by far the best litter box on the market. Made of durable and recycled polypropylene. Your Litter Spinner is attractive, sanitary, comfortable for your pet and will last. 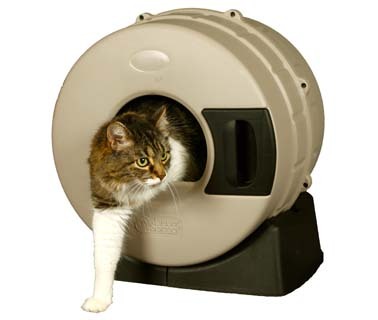 Litter Spinner comes with a 3-YEAR warranty against manufacturer defects which provides you and your pet with the comfort of knowing this is the last litter box you will ever purchase. 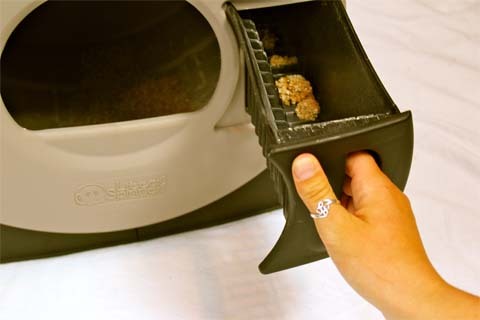 Other automatic cleaning cat litter boxes require that you plug them in and use special trays or litter. They also break easily. When automatic cleaning litter boxes break, you have to rush out and get a replacement which costs as much or more than your last one. If your automatic cleaning cat litter box has to be plugged in, you are limited as to where you can have it in your home. If it runs on batteries, you have to spend money every time the batteries need to be replaced. The Litter Spinner is built to last! We took extra design and engineering steps to insure Litter Spinner is constructed so it is the last cat box you will ever have to buy. We start with manufacturing in the USA. We use the highest grade Polypropylene and use recycled materials whenever possible. We built the Litter Spinner with a “thicker, heavier wall construction so it maintains sturdiness and effective function for years. The “tongue-in groove” design where the 2 drum-halves meet, includes a special hand inserted rubber gasket seal to insure no leaks. The nuts we use for drum are brass and are molded-in for an easy to assemble, secure fit. This means you can assemble and disassemble your unit as often as needed. The base construction and wheels use extra heavy material to insure sturdiness, which accommodate the weight of drum, litter and your cat. In addition, to insure Litter Spinner does not move while cat uses, we have added 2 sets of “divots” molded into bottom of the drum, which align with the wheels. These “divots” position the drum to be secure while the drawer is in the 3 O’clock position, but still allows the unit to spin when needed.